There are two things we love - BALLROOM DANCING and PEOPLE. Our instructors are all passionate about dance and eager to share the joy of ballroom dance with everyone. Have “two-left-feet?” No worries! We have ample experience working with both beginners and seasoned dancers so you will be in good hands! Both single dancers and couples are welcome to our classes. 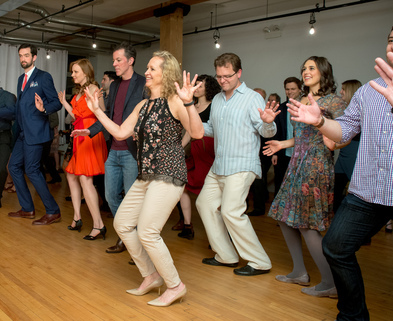 Located in Chicago West Bucktown, Duet Dance Studio offers ballroom dance lessons, wedding dance instruction and kids dance classes. 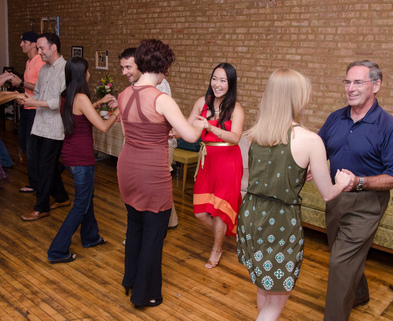 Dances we teach include Salsa, Swing, Tango, Bachata, Merengue, Waltz and Foxtrot. This was so much fun and my husband and I both learned a lot. Great way to spend a couple of hours! It was a great experience. The class was fun, comfortable and super chill. Would definitely go again! This was such a fun way to spend my birthday! I’m not the greatest dancer, but I didn’t feel out of place in the class at all. 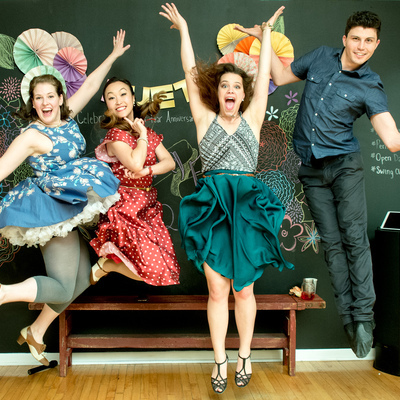 They foster a really fun environment where you’re not afraid to let loose and learn a little bit! I bought my sister tickets to this event as an experience based Christmas gift. We had so much fun. I think an hour was the perfect about of time, and the instructor was wonderful. Looking forward to going two stepping in the coming weeks! This was our first dabble class and it was so much fun! We signed up for the beginner tango class in which we both don’t have any experience in any kind of dancing and it was soo fun. Loved how the teacher made everyone feel super comfortable and didn’t call anyone out (it’s the worst when the instructor is calling out people for doing the moves wrong when it should just be fun and laid back). 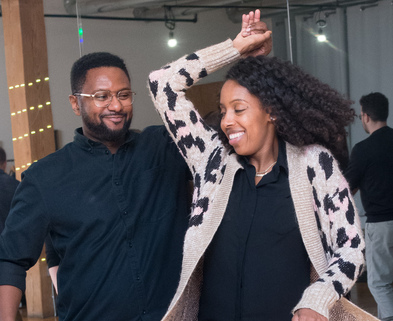 We had so much fun we are thinking of coming back for some more beginner dance classes just as a fun date night. Definitely recommend for a date night or even to come with a group of friends (but everyone who came had a partner). I went with a girl friend of mine just for fun. i have dance experience but she didn't, and we both ended up having a really good time. it was BYOB and we were able to mingle with others, have a drink, and learns some cool dance moves. I studio is really nice and spacious and the ambiance really gets you in the mood to dance! *Bring your own partner. Unlike some other places, this class is really meant for couples, not social. It was a real fun class. Easy, intimate setting. The teachers were real nice. We will be back to try another dance form, at this studio. This was so much fun. I came solo, but they made me feel very welcomed and provided me with a dance partner, ha! I will definitely be coming back for another class. I highly recommend if you need to get away and do something to get your mind off the stress of the week. You get so into it, ie figuring out where your feet should go, that I guarantee you won’t be thinking about work. I had a really good time! I really feel like I learned a lot. The class was set up nicely and the teachers were great, but because it was Valentine's Day, it was pretty crowded. There wasn't really enough room to do the dance you were being taught and I was stepped on multiple times by those dancing around me, one time pretty hard and it scraped up my ankle. I think the class should have been limited to fewer couples to make the experience more positive overall. It was also hard to see the dance instructor's directions with so many couples in the room. What a FUN night of trying something new and seeing some serious talent on display. 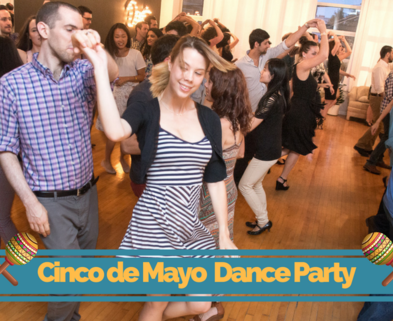 Awesome date night or solo night with everyone willing to jump in and dance! Not only did we learn a very fun new dance with the perfect balance of group and one-on-one instruction but after our experience, a group of students who have been taking dance classes for some time had their winter showcase and we got a really great show. The Duet Dance teachers and community certainly inspired me to keep dancing and coming back. This class was so much fun! The instructors did a great job reading the room and, since many of us came with significant others, letting us do the majority of the dancing with the people that we came with. They broke down the steps in a way that made it very easy to learn! My only wish was that the class was a bit longer! I only wish that the class had been longer! The teachers were wonderful and the class was organized and fun! Grace was an awesome, patient instructor. She really took the time to listen to our first dance song prior to the class. We definitely recommend this class! Very fun class and great date night idea! Definitely beginner-friendly--and they gave us recommendations for places to go dancing after the class. This class was a great way to get out and do something fun on a Friday night. The instructor was awesome and made beginner Bachata super easy to follow. The dance class was super inviting and full of fun! The steps were easy to learn but gave alot of pizazz! Definitely going to join again! Loved the teachers. Most classes I've been to the guys never seem to know what to do to lead. The teachers were really good at explaining exactly what to do while maintaining a really fun atmosphere. We had a great experience at Duet Dance Studio and plan on going back for more classes. The hour of class flew by it was so much fun. great date night outing, and we learned a few tango steps along the way. 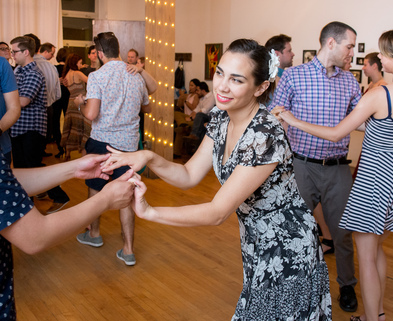 My boyfriend and I had never tried any beginner dance classes before, but thought we would give salsa a shot-- and I'm so glad we did! 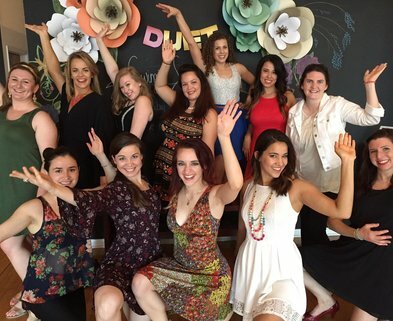 When we arrived at Duet Dance Studio, we were really impressed with the beautifully decorated space and our welcoming instructor. She made it a point to get to know each and every one of us and helped us individually as we tried new steps/turns throughout the class. The other attendees also made the experience so much fun, as many of us were very inexperienced and laughing our way through our mistakes. I would highly recommend this class to anyone looking to try something new. We definitely plan on taking another class here in the future! The teacher gave great instructions and made the dance easy to learn! I attended this class by myself as a way to just take myself out and have a good night dancing. Even though most folks who were there did arrive as a couple, I definitely enjoyed myself! We would rotate partners, so I never felt left out. Also, the BYOB part was great! The instructors for this evening were amazingly cordial and fun. They were genuinely interested in me and my wife's life, and every conversation seemed natural. The instructors were also very knowledgeable. Overall a wonderful time! Would highly recommend - a fun and casual environment. Everyone was very nice and the teachers are great! 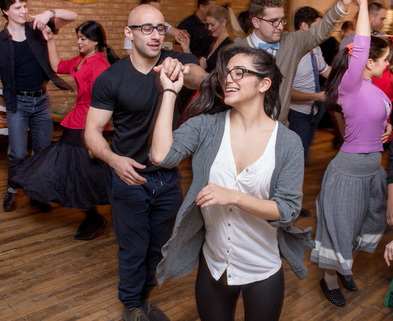 The teachers were very patient and helpful and I could tell that they were very interested in helping us learn how to salsa without putting a lot of pressure on us.I wold definitely take another class here, as it made me want to learn more. My husband and I LOVE Duet Dance Studio and had so much fun with Grace and the gang for this beginning salsa class. We will for sure be taking another Friday night drop in - it was fun get a quick run down of a new dance style and we felt like we had mastered it by the end of the night. The teachers did well in teaching the larger group in attendance. This is our fourth time attending a class at Duet and will continue to go. I do wish we'd spent more time learning and practicing the dance. It would be nice to have the teachers correct us during our practice and give us some pointers. Overall though, we love the themed parties and all the beginner's classes. The atmosphere is laid-back and fun and the teachers are great! Great Class! The right length and the right time to grab dinner and head over! Great experience working on our (somewhat non-traditional) wedding dance. We both felt very comfortable and had a lot of fun. I've done dance classes before but this was the best one I've done by far. I am a very slow learner at dancing! but the teacher makes me feel so good and I was able to dance merengue! We had a fun time! Valentine's Day event. Had a fun time. We really enjoyed this class! Learning the dance routine was fun and easier than expected. We will be back. We had such an amazing time at the Ugly Sweater Class. On top of learning beginner's swing, we participated in the ugly sweater contest and had fun learning the surprise dance at the beginning of class. My wife and I had a fantastic time in our dance class. It was laid back and fun. The steps were very simple and basic. Perfect for beginners(which is just what we needed) but another couple, who was taking classes there and were obviously better than the average Joe, were also dancing along and having a great time. I'm sure we will be back! we have even considered taking a private class. My wife loves dancing, so I knew she'd enjoy this class for her birthday. This particular session only had two couples, which made the experience more intimate. The experience was BYOB and while we did't bring any beverages, the other couple was happy to share some of their wine. It felt like the class ended just as we were getting the moves down, so I wish it would have been a little longer, but otherwise a great experience. We plan to do more in the future. Fun and relaxed. The space was super cute! It was a smaller class which gave us more one-on-one teacher time and the other people taking the class were fun and chill which made the experience that much more fun. I highly recommend taking a this class for anyone- experienced and beginning dancers. My wife and I had a great time. The instructor, Murial, was very sweet and nice. She explained each step very thoroughly and helped us get back on track if we lost our steps. We had SO much fun! We plan on doing the other classes that they offer! My partner and I have always wanted to try ballroom dancing and I'm SO glad we went with this class. The instructors are so friendly, attentive and certainly know their moves! The fact that it's BYOB is great too, literally the perfect date night. We will be back for more! This is a fun class with lively, entertaining instructors. No dance experience necessary! In 50 minutes, you'll get the basics. It's really a lot of fun and a great way to spend a Friday night. I highly recommend it! I absolutely loved being at this dance event. I had a lot of fun. I've never been to a formal dance studio. I felt comfortable the whole entire time. I would go again in an instant. Fantastic class! Started with some basic moves and build upon that. Teachers were fantastic and helped everyone along. Great intro class to Salsa! Will return for more! CY, Grace, and Marielle are awesome! They help beginners (like me) get the basics down in a very easy-going way, but then give quality pointers on the finer details as you get more experienced (I came for the drop-in classes but now I'm staying for some private lessons). All in all, it's a great time and definitely worth checking out! Fantastic! The entire class was so fun and engaging, the teachers made everyone feel comfortable. We will most definitely be back! My boyfriend and I attended a class and it was great! There were about 8 other couples in attendance, which was great for individualized instruction. Both instructors were extremely friendly and very helpful. I would highly recommend this class for couples! We had a lot of fun!! The instructors were so friendly and helpful. They were very easy to follow. We had a wonderful time and already feel better about salsa. We will definitely try more classes! It was much better than we had expected! Although my fiance was very nervous to attend a group class without prior dance experience, we ended up being happy we started with the group class instead of private lessons. The teacher put everyone at ease over a few basic steps, and soon we were making progress. I recommend the group class because switching partners made a huge difference in loosening up the mood. You are able to refine your steps with each rotation so that returning to your partner is more fun and easy-going. The group setting takes the pressure off. Fun date activity, liked the switching of partners. Dancing was VERY easy to do. We had so much fun! Dancing was delightful and easy to pick up with this teacher. C-Y leads a terrific, warm class in her welcoming studio. We had such a good time and left feeling much more confident than when we entered. We'll be back! really fun!! would go again? Szewai is an engaging and talented teacher. We greatly enjoyed our evening and walked away with a permanent imprint of the basic salsa steps. We look forward to returning with friends to make a party out of it. This class was a lot of fun! The teacher was really friendly, and it was really casual environment. I felt like I actually learned a usable dance.I'm definitely considering taking more classes in the future! C-Y is a great teacher. She gives a demo of the dance step and then lets the class attempt to imitate what she did. Very caring and patient with those of us with two left feet!. I will take more classes from C-Y in the future. It was a cold outside, but caliente inside the dancing studio. Szewai (C-Y) did a great job teaching us the basics of the tango. It was fun environment, and I would recommend bringing booze. 123456788910 we all had a great time! My girlfriend and I have always said we wanted to take a dancing class. We wanted to do something different to celebrate 3 years being together, so I looked on Dabble and found this class was on the day. I signed us up on the spot! Szewai was a great, patient, and energetic teacher. Hope to go back soon. Thank you so much Cory! Look forward to seeing you and your girlfriend soon! Thank you Andrea! I'm glad you enjoyed it. See you again soon! I took this class a couple of weeks ago and it was really fun! I went with a friend and looking forward to going again with my boyfriend. I strongly recommend it! Szewai (C-Y) Lee is an excellent instructor and really fun. Enjoy! Thank you Erika! I can't wait to see you and your boyfriend soon! I have two left feet and was still able to learn the steps. We had a great time and we'll be back soon! Thank you Anna! I look forward to dancing with you again! The time flew by so fast! Which is always a good indicator of having a great time :) The studio was really cute, and easily accessible, and the class was fairly small, which was nice since it gave Szewai a chance to try to help each of us out when she could. We did rotate, except for one couple that wanted to learn the moves together. Maybe that couple signed up & paid for the group classes outside of dabble, but it was still cool that the class gave them the option to learn with one another while the rest of the us still rotated. Angeline, thank you so much for your kind words and I'm glad to hear that you had fun dancing! Rotating partners is a great way to practice leading/following. 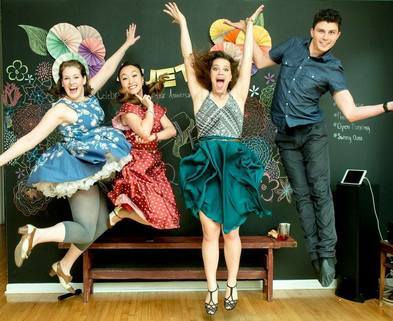 Since everyone leads and follows differently, students will get better by dancing with a variety of partners. Plus, it also gives people a chance to socialize! :) But I'm also fine when a couple wants to stay together. I want to make sure everyone feels comfortable learning. And you did a good job demonstrating! It's not easy to simply let go and follow but you did great for your first time. :) I look forward to dancing with you again soon! Great class! Instructor was knowledgeable & format worked well. Had fun & feel comfortable with basic salsa steps. Thank you for your kind words, Lynn. It was wonderful meeting you and dancing with you! Hope to see you again soon! AWESOME! This was the perfect class for beginners like us and a great date night! CY is the best and the space is really cute. I can't wait to try more of her classes. Yay!